ATLANTA, Georgia, August 4, 2014 (ENS) – The Emory University Hospital in Atlanta is treating the first American infected with the deadly Ebola virus in a specially built isolation ward near the country’s main medical agency, the Centers for Disease Control and Prevention. 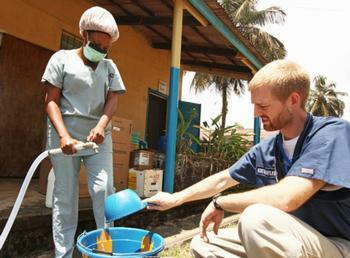 Dr. Kent Brantly, 33, a medical missionary, caught the disease while caring for Ebola victims in Liberia. Across four West African countries, the viral hemorrhagic disease has killed 729 people to date and sickened at least 1,323. To date, more than 60 health care workers have lost their lives in helping others, eroding the capacity of these countries to respond. Dr. Brantly, the first known Ebola patient on U.S. soil, traveled to the hospital by special plane and ambulance Saturday. Attired in a hazmat suit, he climbed down from the ambulance under his own power and walked into the facility. Hospital officials said in a statement the facility is physically separate from other patient areas and has unique equipment and infrastructure that provide an extraordinarily high level of clinical isolation. It is one of only four such facilities in the country. Because it can transport only one person at a time, the plane is now returning to Africa to pick up another Ebola-stricken American, Brantly’s fellow missionary, Nancy Writebol. She also will be treated in Emory’s isolation unit. Dr. Jay Varkey, an infectious disease specialist at Emory who will care for Dr. Brantly, said Americans need not fear the illness will spread to the general population. “Unlike the flu, like influenza, which we deal with every winter, Ebola cannot be spread through the air,” he told The Associated Press. The virus can only be transmitted through blood and bodily fluids, he explained. There is no known cure for the Ebola virus. Victims experience fever, weakness, pains and headache, followed by vomiting, diarrhea and kidney and liver dysfunction. In its final stages, the disease causes internal hemorrhaging and bleeding from the ears and mouth. Dr. Brantly was serving as a medical missionary with Samaritan’s Purse, a nondenominational evangelical Christian aid organization. He was a general practitioner at a mission hospital in the Monrovia suburb of Paynseville, where he directed the hospital’s Ebola clinic, wearing full-body protective gear in the equatorial heat for up to three hours at a time. Samaritan’s Purse is evacuating all but the most essential personnel to their home countries. Dr. Margaret Chan, director-general of the World Health Organization, assessed the Ebola outbreak Friday with the four West African presidents at a meeting in Conakry, Guinea. The Ebola outbreak is affecting a large number of doctors, nurses, and other health care workers, one of the most essential resources for containing an outbreak, she said. “West Africa is facing its first outbreak of Ebola virus disease. This is an unprecedented outbreak accompanied by unprecedented challenges. And these challenges are extraordinary,” Dr. Chan told the presidents of Guinea, Liberia, Sierra Leone, and Cote d’Ivoire. West Africa’s outbreak is caused by the most lethal strain in the family of Ebola viruses, she said. “It is moving faster than our efforts to control it. If the situation continues to deteriorate, the consequences can be catastrophic in terms of lost lives but also severe socioeconomic disruption and a high risk of spread to other countries. “Traditional funeral practices are a well-documented spark that ignites further chains of transmission,” warned Dr. Chan. “Chains of transmission have moved underground,” in some areas, she said. They are not being reported because of Ebola’s high fatality rate, which causes victims’ families and friends to choose to care for loved ones in homes or seek out traditional healers. They may have to place restrictions on population movements and public gatherings, she said. Despite the absence of a vaccine or curative therapy, Ebola outbreaks can most certainly be contained, Dr. Chan assured the four presidents. Under the provisions of the International Health Regulations, Dr. Chan has convened an Emergency Committee that will meet on August 6 to assess the international implications of West Africa’s outbreak.